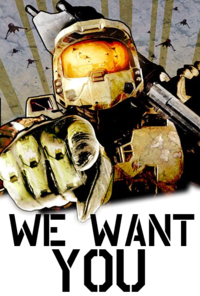 Hello, and welcome to Halopedia, a fansite dedicated to the Halo franchise and its fictional universe! Halopedia is primarily a wiki with a mission to document every aspect of the Halo series. However, Halopedia is also home to a community of likeminded fans, dedicated to building the wiki and making it the best it can be. To that end, the site has many social features available, such as the forums, talk pages and the Discord server. A wiki is a website where users collaborate to create a detailed documentation of a particular topic. The crucial difference between an ordinary encyclopedia and a wiki, however, is that absolutely anyone can view and edit a wiki, for free. In essence, a wiki is simply a specialised online encyclopedia, maintained by fans of its topic. For instance, the most widely known example of a wiki is Wikipedia. Unlike Wikipedia, however, Halopedia exists to specifically document the Halo series and its universe. As a result, all information held within the confines of Halopedia is related to Halo, either directly, or peripherally. Halopedia began in 2004, and has had a long, awesome, and interesting history since its inception. While visiting the site, Halopedia asks that you follow the rules and policies that are in place here. The rules are designed to ensure that all users can happily and peacefully coexist on the website, as well as to guarantee a minimum level of quality for all content on the wiki. Although the rules are outlined in much more depth in the policy pages, they can be found summarised here. Halopedia is always on the look-out for new users, as editors are the lifeblood of the wiki. Anyone with an interest in Halo is welcome to join in and work on the wiki. You don't need to make an application or ask permission first; simply make an account, familiarise yourself with the rules and Manual of Style and then get stuck in! For newcomers looking to help out, Halopedia has a page containing useful tips to help them get started, which can be found here. In addition, if you need help editing, Halopedia provides an array of useful help pages, which can be found at Help:Contents. Halopedia has a large collection of information pages that go into further in-depth about the site and its operation. If you would like to know more, one of the following pages should be able to answer your queries. In addition, at the bottom of this page is a complete list of all official Halopedia information, policy and help pages, in case the above pages didn't give you the information you need. If you still have unanswered questions, one of Halopedia's administrators would be happy to help you. A list of admins can be found here.